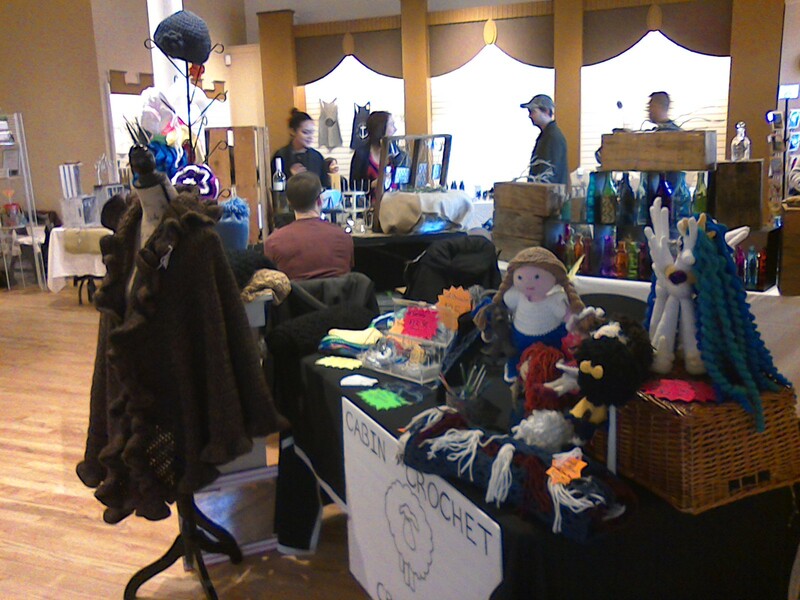 Here’s my table at the HoneyCraft Market for Groundhog Days in Woodstock Il that was today from 10 til 4! You missed it! There will be another one sometime this summer. I am too tired to write any more. I got a message the other day from an old friend from Jr. High and High School. She asked if I made any amigurumi inspired by the “My Little Pony” characters. I hadn’t up until that point. She told me that there are a lot of young adults that loved these classic characters. I remember when I was growing up, my sister had some of these “dolls”, for lack of a better word. I found out that there are new cartoons out with new “My Little Pony” characters. Again, I found a free pattern for the body, thanks to knitoneawesome.blogspot.co.uk! I crocheted the eyes and had a dickens of a time embroidering them on! I also found a pattern for a six-pointed star for her “cutie mark” on her rump. Again I embroidered the white stars around the “cutie mark”. I crochet! I don’t do embroidery unless I absolutely have to! My sewing, by hand is getting better, too. It’s funny. I learned all of these skills: sewing, embroidery, knitting, when I was, like, 8 or 9 years old. Here I am 40 years later actually using them! I never learned to crochet back then. I only learned about a year and a half ago off of YouTube videos! So…here is MY little pony, inspired by Twilight Sparkle. If any of you Bronies would like one, contact me at cabincrochetcreations@gmail.com!